 The Posthumous Memoirs of Br†s Cubas ($25.00; Nov.; 256 pp. 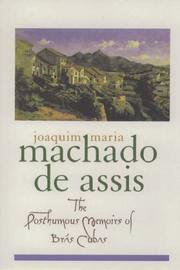 ; 0-19- 510169-3): This earlier (1881) novel by the prolific Machado (18391908) employs the same essential technique (stops-and-starts, authorial expostulations, direct addresses to the reader) to tell the story, following his death and written from the ``other world,'' of its amazingly blasÇ title character and narrator. Br†s Cubas, the scion of a wealthy family, while laboring to mass- produce a miraculous ``poultice'' that will guarantee the health of mankind, unwisely ignored his own and died--leaving unresolved a dizzyingly amusing farrago of personal, professional, and sexual preoccupations. The story's form, of course, recalls Tristram Shandy. Fortunately, so does its wealth of vivid supporting characters--at least one of whom, the ineffably confident ``philosopher'' Quincas Borba, belongs with his uniquely gifted creator right up there among the immortals.